Please choose a short (25 character maximum) name for the recipient of the product Better Than Sour Cream by Tofutti. IMPORTANT SHIPPING INFORMATION FOR THIS ITEM BELOW– PLEASE READ! Spice up your baked potato, Mexican dishes, dips, or use as a replacement in any recipe – this certified kosher sour cream tastes as good as the real thing, and if you didn’t know it was dairy-free you’d swear it wasn’t vegan! 12 oz. (240g) container is $3.99. From Anonymous of Florence, Kentucky on 3/29/2019 . I just recently became vegan, and as someone who really, really likes sour cream, this was a no-go for me. It is very thick and sweet tasting. The consistency and taste is very similar to cream cheese, with also a slight taste that is similar to the way glue smells. Not for me. It is nothing like sour cream and I will never buy this again. From Anonymous of Vancouver, British Columbia on 8/15/2018 . Oh my god, this smells and tastes like paint. I actually spat out the bite of taco I had with this on it. I can't believe this is on the market. Do you like eating paint? From Ashley of Calgary, Alberta on 6/26/2018 . I opened this and hoped to smell the deliciousness of sour cream, instead I was met with a familiar smell, my acrylic paint. Not appetizing. I thought maybe it would taste different from the smell, but it tastes exactly as it smelled and what I assume paint would taste like. Awful. Just awful. I'm not even sure how it can still be in shelves. From Jeff Skinner of Owen, Wisconsin on 6/26/2018 . Buy it once, and it's all liquified and cottled. Buy it again, and it's hard as a brick. Unreliable. From Anonymous of Mountain view, California on 9/13/2017 . I have never tasted anything so disgusting. Me and my boyfriend decided to dump it to trash and we normally eat everything. Nothing like sour cream guys. Warnings apply to your shopping cart. Please enter your Gift Certificate Code. Gift Certificate has been activated! There is remaining on this Gift Certificate. 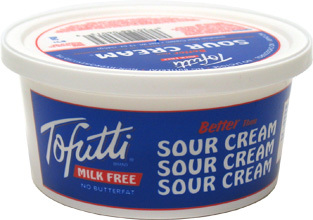 Please submit a review of the product Better Than Sour Cream by Tofutti. Notify me when the Better Than Sour Cream by Tofutti is in stock. The e-mail to your friend will include standard text from VeganEssentials, including a link to the product Better Than Sour Cream by Tofutti and a picture, if available. If you would also like to include personalized text, please enter it in the box below.